Rome is one of the oldest and biggest cities in all of Europe. It is the capital of Italy. 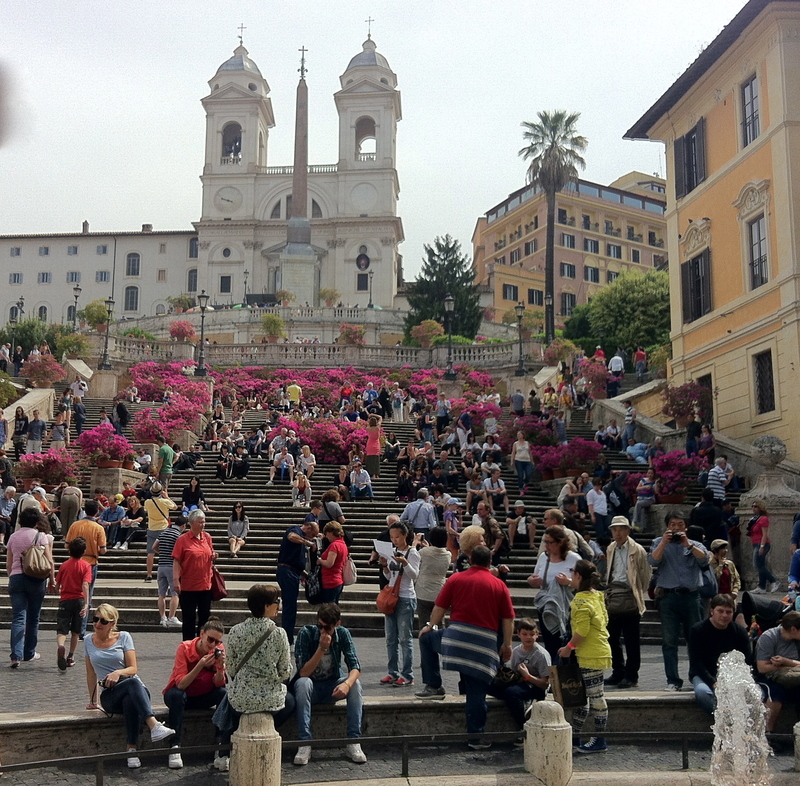 It is crowded with tourists, residents, ruins and a whirl of streets, stores and steeples. One of my plans this year was to be able to visit without getting lost. 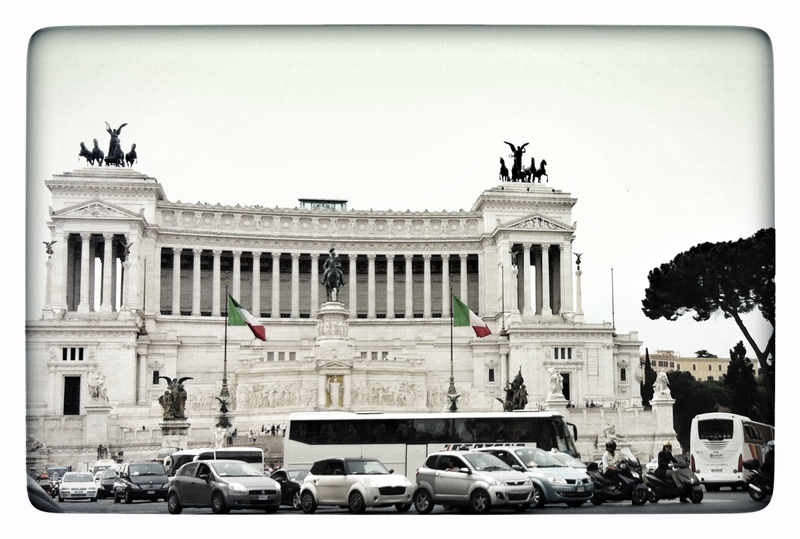 Because Rome’s airport brings in most of our guests, we’ve made several trips to the eternal-ly confusing city. I have sometimes gone through two maps while I’m there. The first can become threadbare after just one long walk. 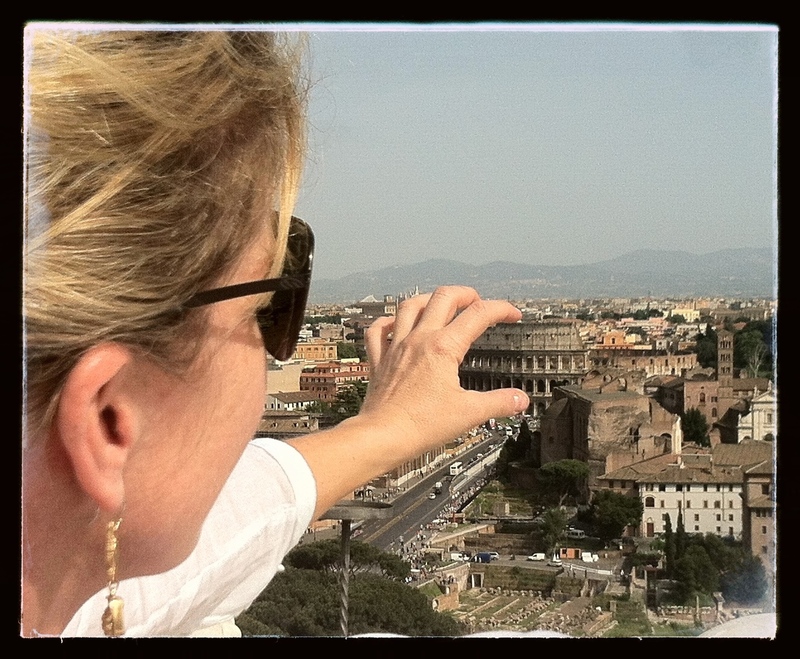 However, I love Rome. It might be my favorite city in all of Italy. When I’m there I feel happy and energetic and inspired. I always leave wanting more. After each trip, I feel like I’ve just begun. This week was my fifth extended stay. I met my friend Stacia who arrived Sunday to begin a summer job sailing around Sardinia. 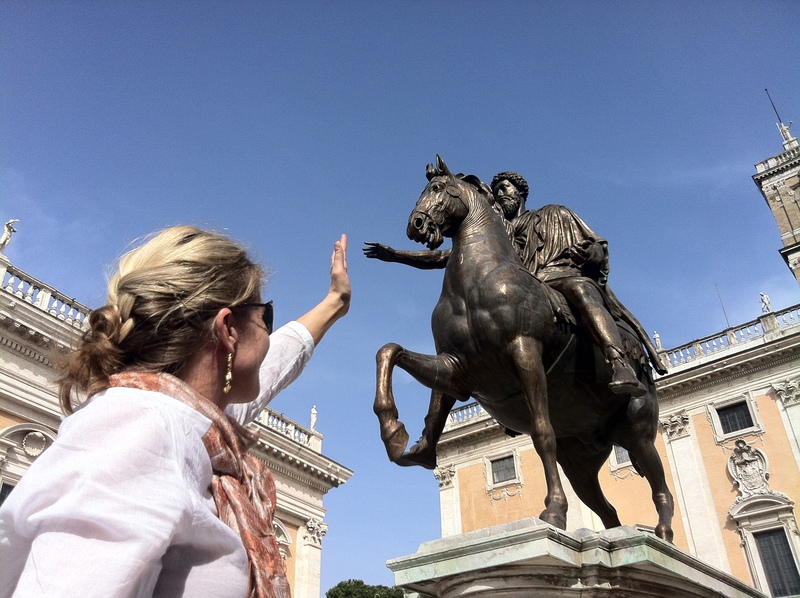 During our three days together, we walked down miles of ancient alleys, past innumerable fountains and impromptu piazzas while frequently stopping for drinks and Roman artichokes along the way. It was a perfect little vacation. The temperatures soared into the 80s; the monuments glowed; the Romans were good to us; and we never got lost. What a great feeling to finally grasp this place. 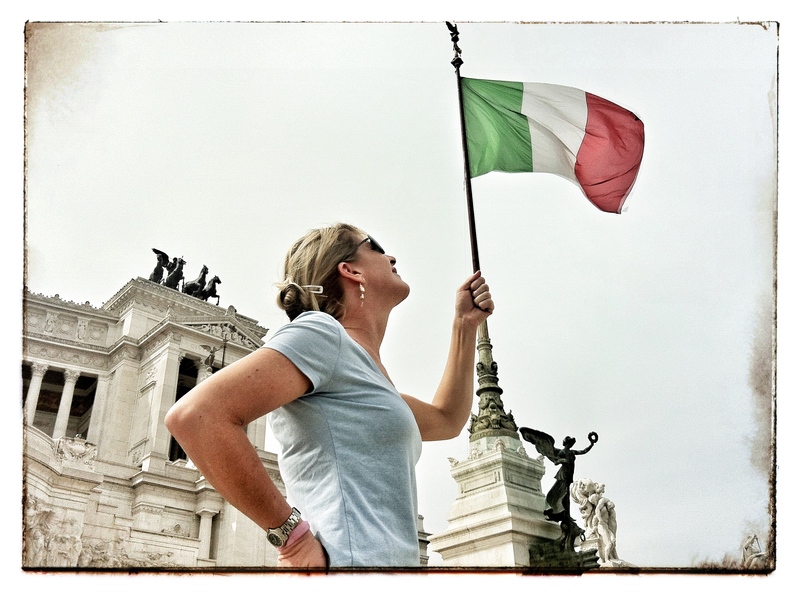 One of my favorite tourist stops in Rome is the glass elevator ride to the roof of the Vittoriano. From there, you can see everything. Stacia and I spent time up there taking photos and getting a lay of the land. 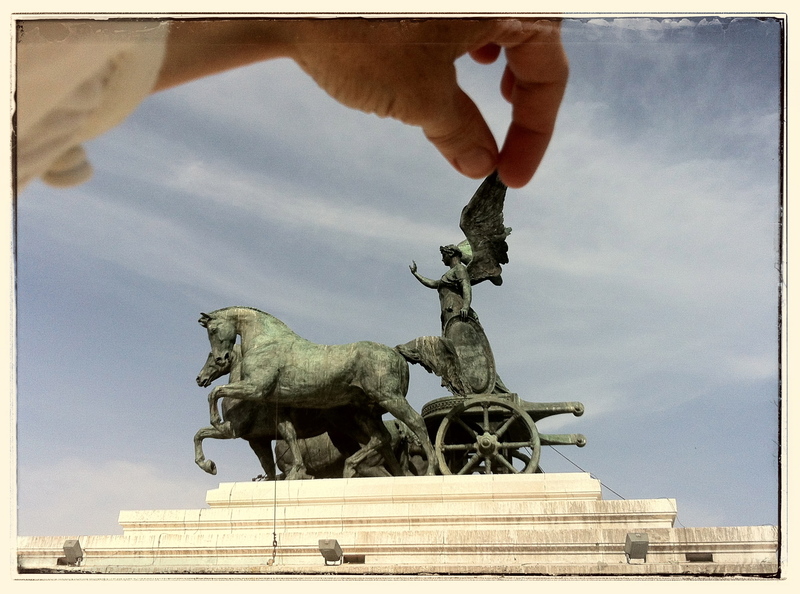 Since Rome can often dwarf the wide-eyed tourist, we counteracted by playing “optical illusions” with the camera. These enormous statues on top don’t look so enormous anymore. 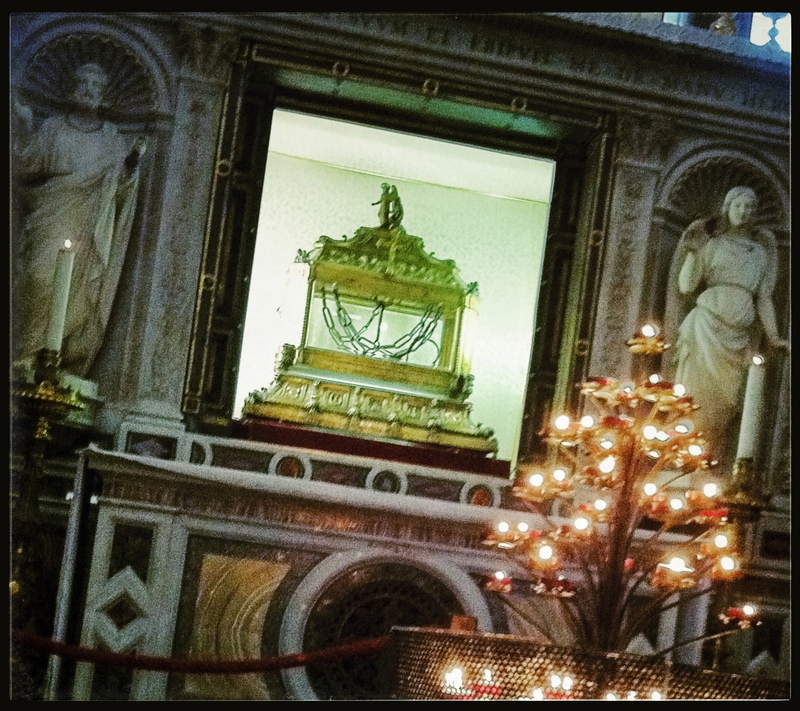 San Pietro in Vincoli: Just as many people visit The Chains that bound St. Peter as Michelangelo’s Moses. 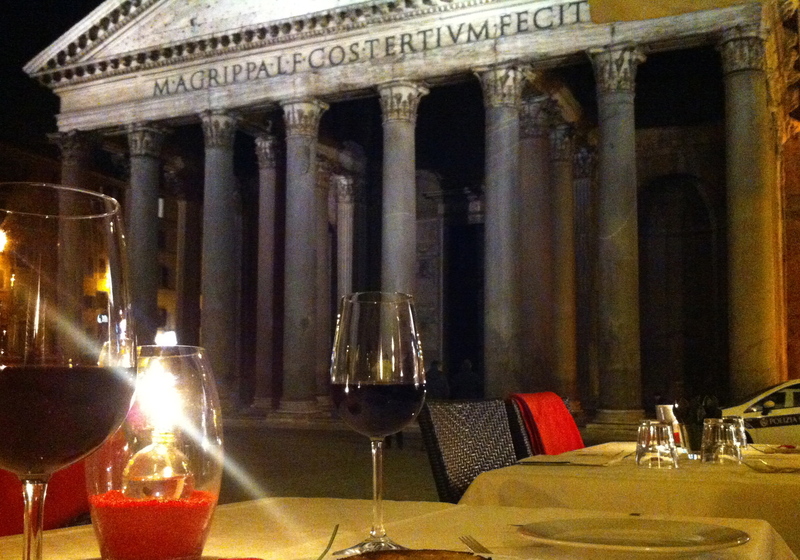 Besides the many guide-book worthy landmarks, we toured past other quintessential Roman details. Fountains: there are over 200 in this city. Some are purely decorative, but many can be used for filling up water bottles or drinking straight from the source. In ancient Rome, there were at least nine aqueducts that channeled water into the city for its inhabitants. Some of them are still in use. 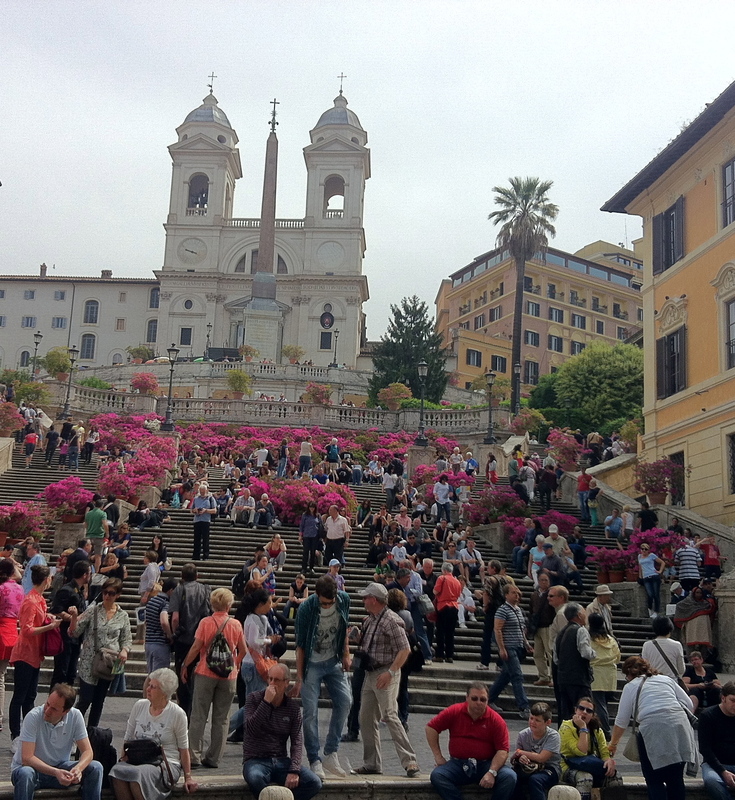 Our final walk led us to the Spanish Steps where we played Where’s Waldo in the crowd (which does not officially count as being lost in Rome). Here are a couple pictures of Stacia. She’s is wearing jeans and a light blue t shirt (see opening photo). On Tuesday afternoon, we packed up. 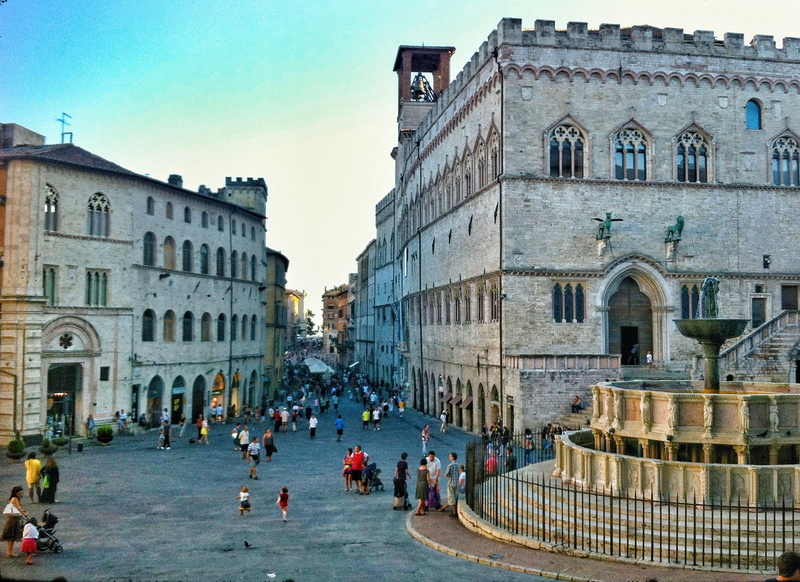 After parting ways at the train station, I headed back to Perugia. Somehow Rome lingers. I know our traveling days are numbered so I immediately started planning another visit later this month, a quick 24 hour embrace; just one last time to touch the familiar and find something new. My mom and dad are ready for some sighseeing. We’ve had 20 guests over the last nine months, the latest being my parents and my brother’s family. 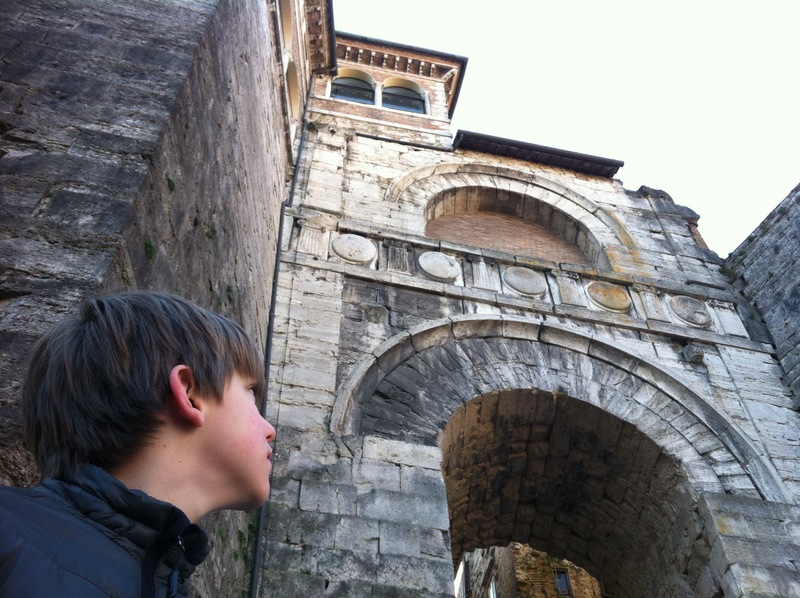 During the past couple weeks, we devoted several mornings to long walks around town and a tour of our favorite sites. Our must-see list is always changing; we have new favorites all the time. 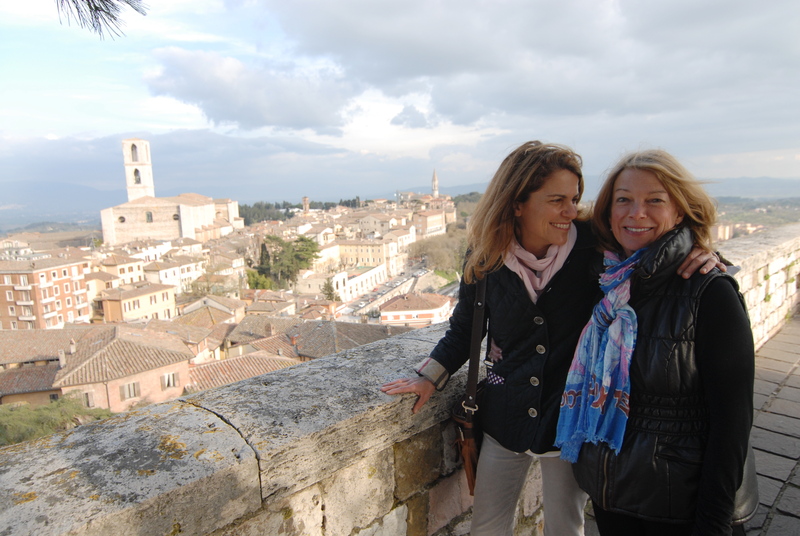 And while there really isn’t any required stop in Perugia, there are lots of little interesting things to do and see. For a little dramatic punch, I like to start at the eerie, 2000-year-old Etruscan Well. It’s right around the corner from our apartment, and it only takes about five minutes to see. 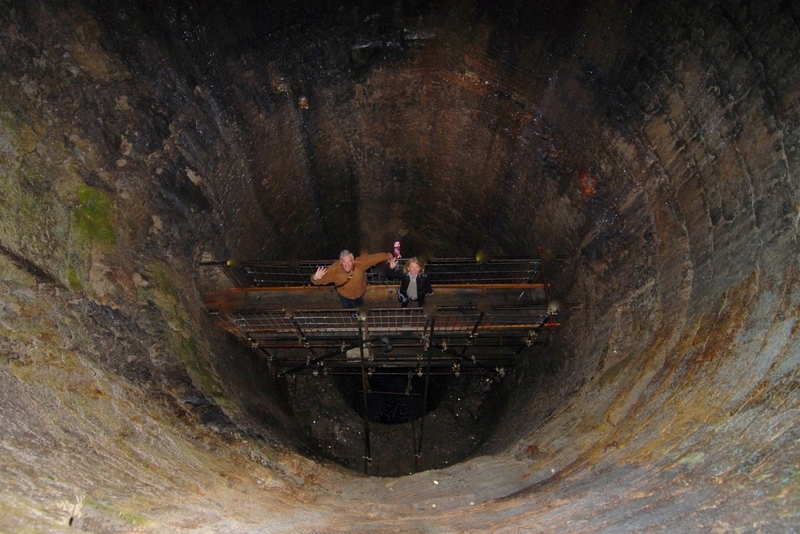 Once you enter, you can walk down a dark, damp, stone path to a bridge which crosses the base of the well. The air is warm and humid. It looks and smells ancient. My dad and mom wave from down below. 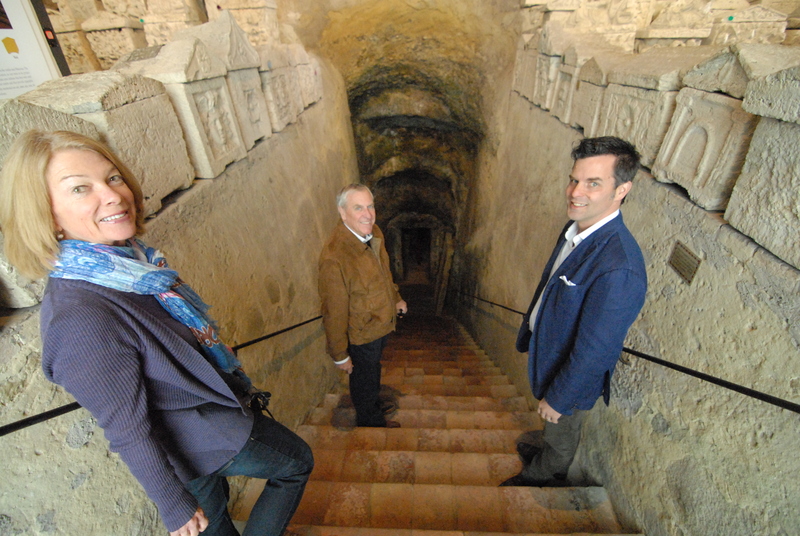 And even more Etruscans ruins: five minutes outside the city is Ipogeno dei Volumni where 200 tombs are on display. The best part is the walk into the dark underground chamber where the largest tombs lie. On both sides of the stairway sit the carved stone urns which held the ashes of the dead. Mom, Dad and Matt head below. 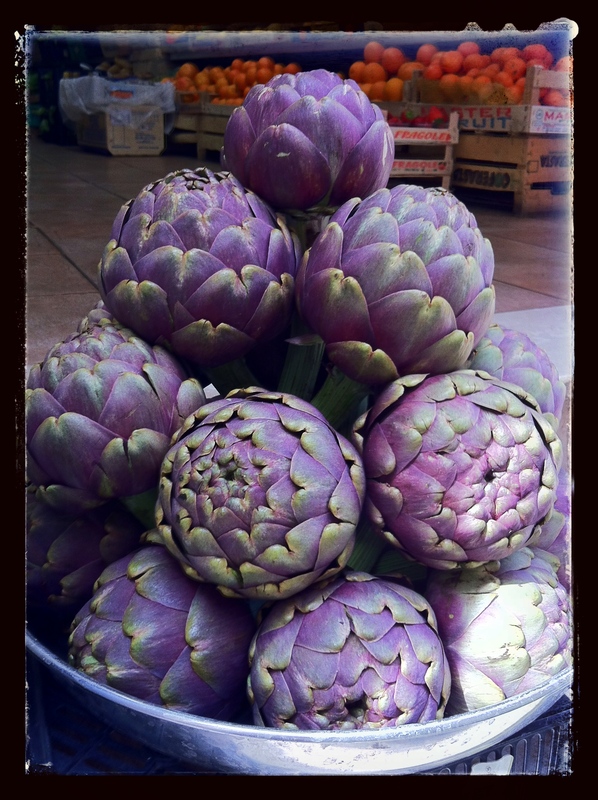 Back in the center of town, some important sights are found around the main square, Piazza IV Novembre. 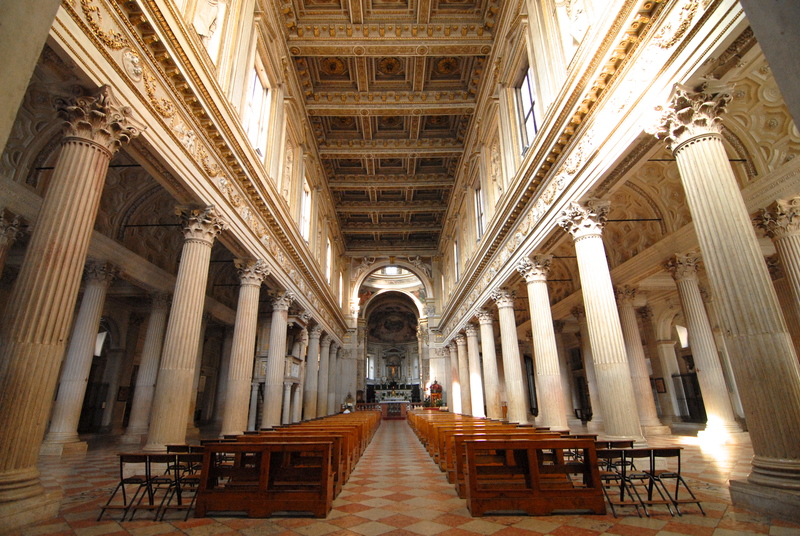 First, there’s the Cathedral of San Lorenzo. 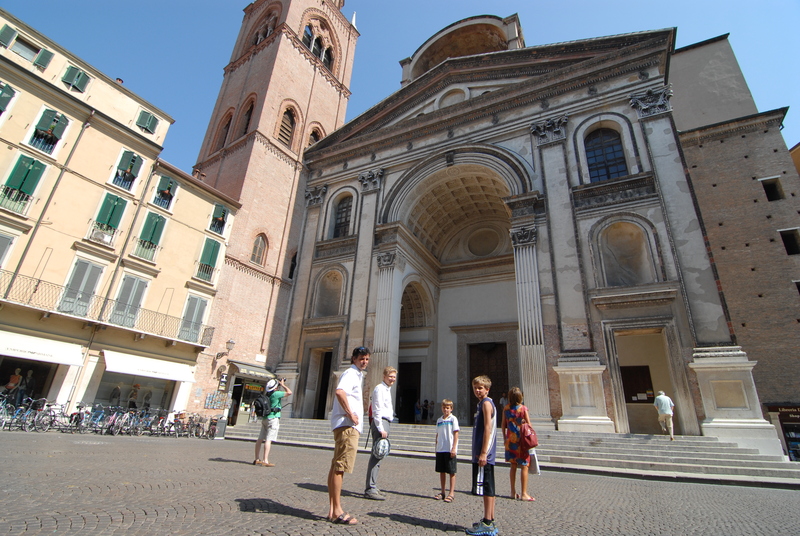 San Lorenzo is one of three patron saints of Perugia. He was grilled to death by the Romans when Christianity was illegal. Inside the church sits the wedding ring of Mary. Yes, the actual wedding ring of the actual Virgin Mary. From the main piazza, one can take Corso Vannucci to the other side of town. On the way, there is the National Museum of Art, which is okay. It’s a far cry from the Uffizi; however, if you like paintings of the Madonna with child, Tom and Ray counted more than 75. Next door is the Collegio del Cambio, a small room that was frescoed by Perugia’s most famous Renaissance artist, Pietro Vannucci, known as “Perugino.” This is a more efficient stop for art. 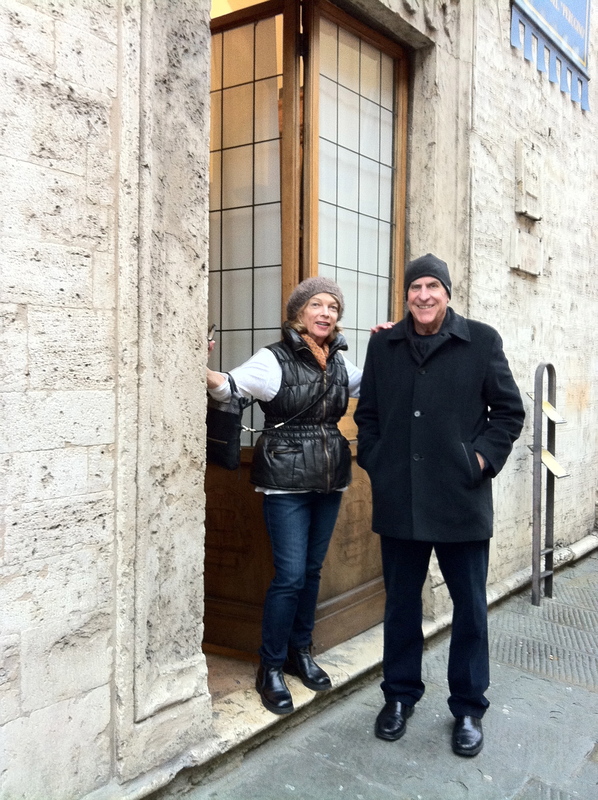 Mom and Dad outside the doors of the Collegio del Cambio. 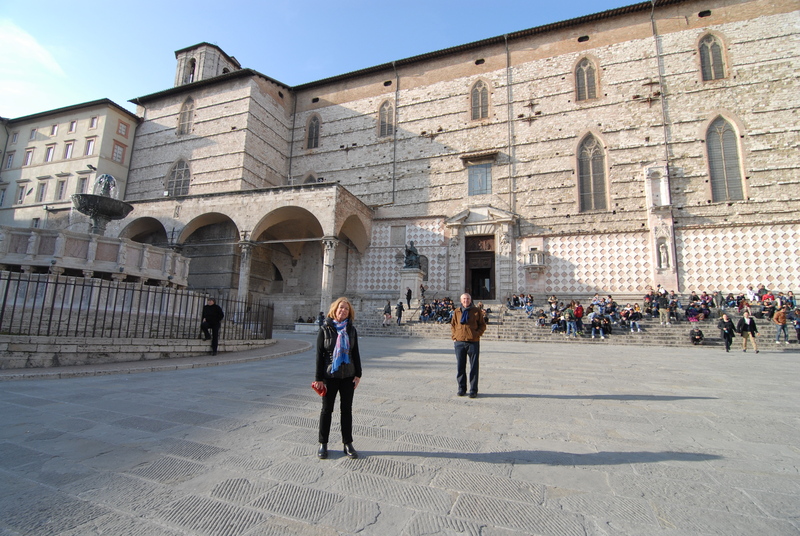 The frescos would make the top of my list for art in Perugia. 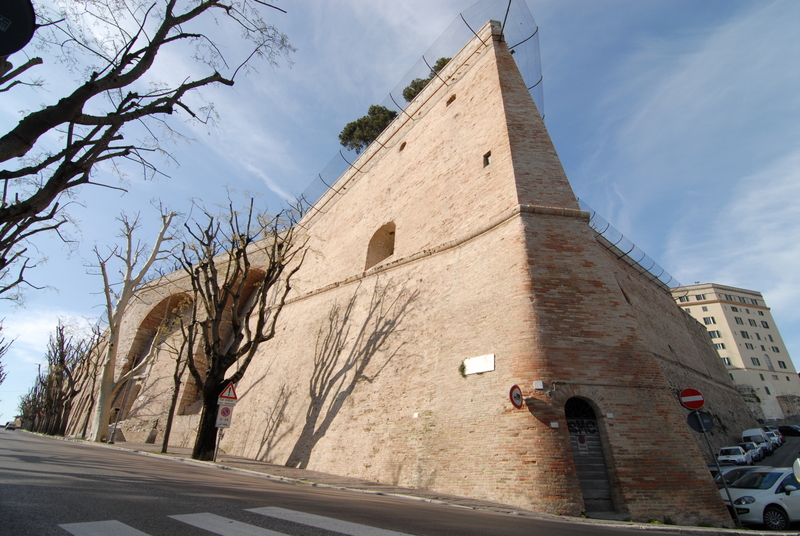 Further down the street sits a piece of the Rocca Paolina, a huge fortress build by Pope Paul III to assert his dominance over the rebellious Perugians. On it is the inscription, “To curb the audacity of the Perugians.” We always take visitors down the escalators (underneath La Rocca) to see the remains of Perugia’s medieval city that Pope Paul destroyed. The Perugians later destroyed much of the fortress. One of Perugia’s assets is its location high on top of the hills. The benefit is a great view in every direction. To simutaneously see the countryside and the city, we walk down Corso Garibaldi to Porta Sant’ Angelo. 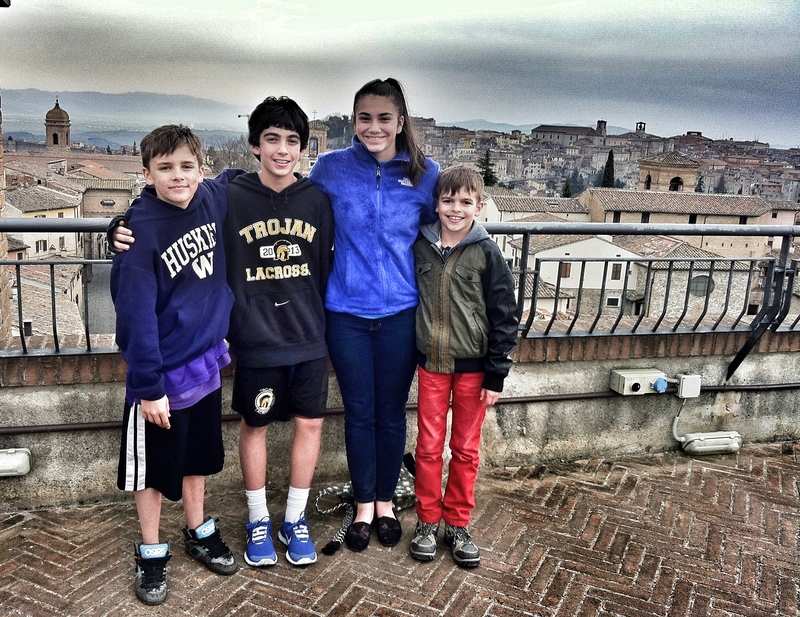 Last week, the boys climbed to the top of the tower with their cousins. In the distance, we can almost see our apartment. And on the other side of town, in Piazza Italia, we can see two of Perugia’s most important churches, San Dominica and San Pietro. My mom and I and a great view. San Dominica is the huge church to the left, and the spire of San Pietro rises further in the distance. 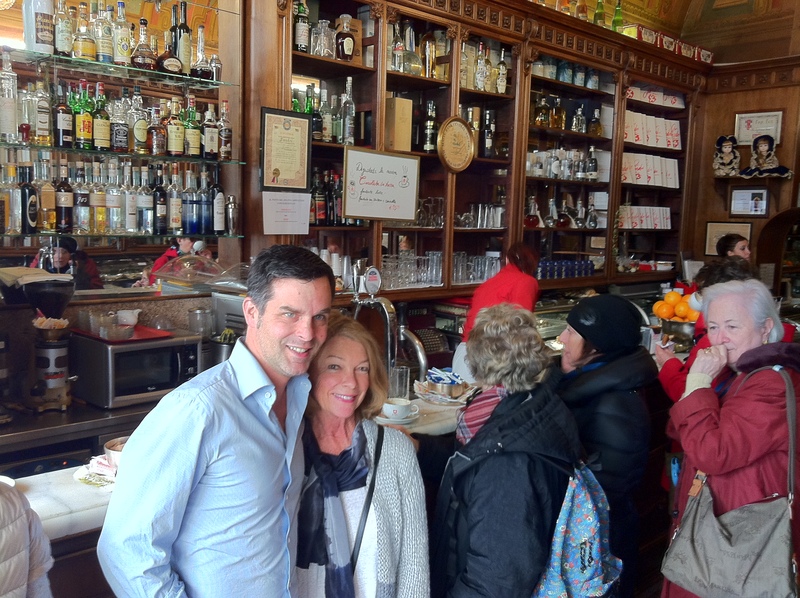 Finally, whether for coffee before the sites or an glass of prosecco after, we like to visit the oldest and most distinguished cafe in Perugia, Sandri. There have been a couple spontaneous decisions during this little trip, one of them being our final destination. When we asked for suggestions before leaving Bellagio, the waiter, hotel manager and pool guy unanimously agreed we should visit Mantua (Mantova in Italian.) So we set off. 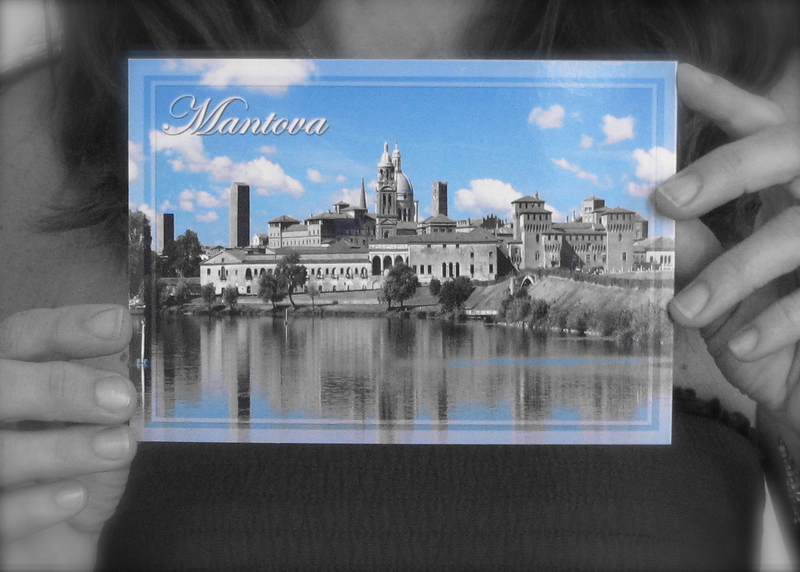 Before today, all I knew about Mantua was that Romeo was forced to move there after killing Tybalt. But now I also know that roast donkey is the local specialty. And I know what it tastes like, too. 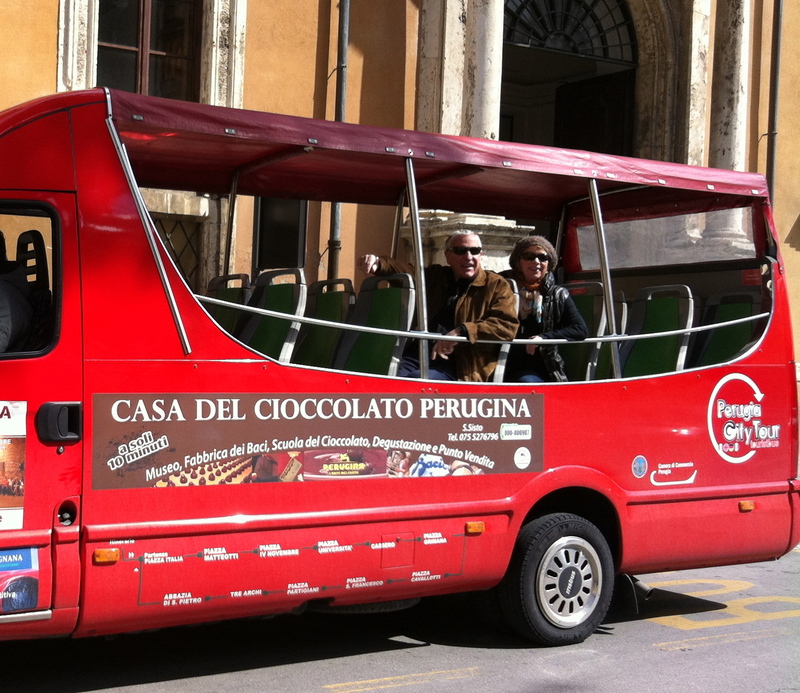 As soon as we arrived, we booked a tour with Daniele. He’s a guide we found on the internet. 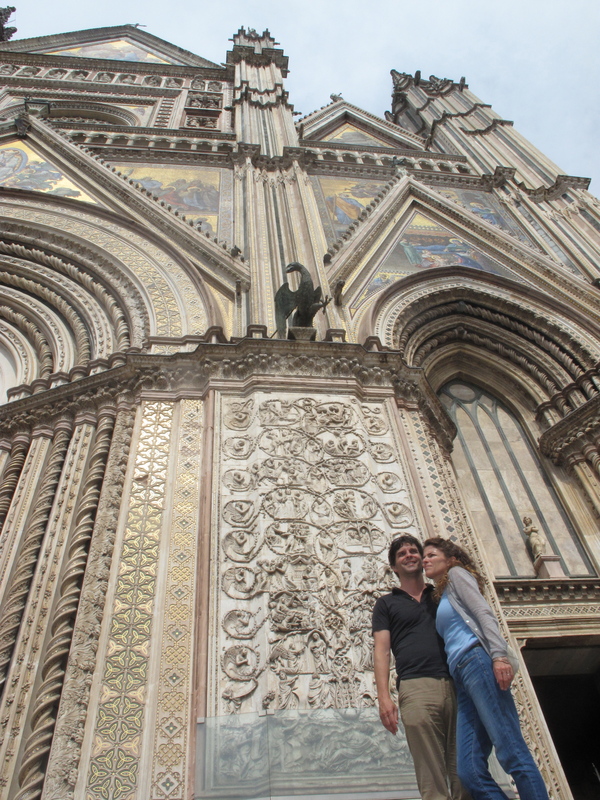 The first stop was the Cathedral of Sant’ Andrea. This is a pretty big church for such a small town. But there’s a good reason. Daniele explained: Back when Jesus was nailed to the cross, some drops of blood fell to the earth. They were later collected in a jar and brought to Mantua. This church was built to house the holy relics. Unfortunately the containers were lost over the years. But fortunately, they were found again in a different area in Mantua. And so another cathedral was built. We didn’t get to see the blood because there was an earthquake last May and many of the rooms which display art and artifacts are under renovation. But we’ll be back because this was one of our favorite Italian towns so far. I loved the tiny winding streets, the four interconnecting piazzas, the pumpkin tortelloni, the sparking red wine , and the lady who owns the hotel where we stayed. Our one-night excursion turned into two. But I would have liked to stay for a week. On Sunday evening, our northern Italian trip ended. We arrived home to find a dead bat on the living room floor. Later that night, the power went out. Matt was able to find the fuse box on the ground floor while I stayed in the apartment. We communicated with text messages until the proper switch was flipped. And after hiking back up six flight of stairs, it went off again. It was definitely time to open that souvenire bottle of lambrusco we brought back from Mantua. 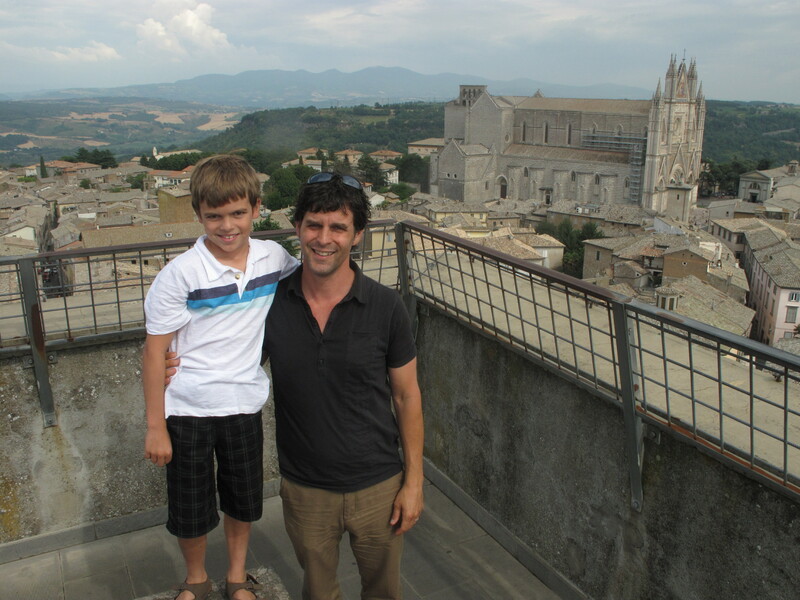 On our way out of town, we climbed the famous tower called Torre del Moro. It’s in the center of town and promised a sweeping view of the city. We hiked up 243 steps to the top. Tom took one look and said, “Rewardless.” Matt, Ray and I disagreed; we hung out for a while as Tom began the descent.